For weeks, former CIA Officer Sabrina DeSousa expected a knock on her door that would lead her to an Italian prison over a 2003 rendition she never participated in. Her plight changed for the better when IPT Senior Shillman Fellow Pete Hoekstra – a former House Intelligence Committee chairman – took up her case with Trump administration officials. Click the play button above to hear John Rossomando's interview with Sabrina DeSousa and Pete Hoekstra. A full transcript of the interview is posted below. DeSousa also discussed her case in a recent television interview, which can be seen here. Transcript of John Rossomando's interview with Sabrina DeSousa and Pete Hoekstra. "Welcome to IPT News Podcast. I am John Rossomando and I will be your host. I am honored to have with us today IPT's Senior Shillman Fellow and former Congressman, Pete Hoekstra, and our very special guest Sabrina de Sousa. 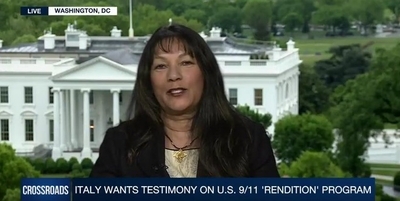 Sabrina is a former CIA case officer who recently faced extradition from Portugal to Italy after being convicted in abstentia in 2009 for a rendition case of Abu Omar. Sabrina, I just wanted to start off by asking you what your life would be like or what exactly you thought you were getting yourself into when you signed up to be a CIA case officer in the early 1990s?" "I think for most people in the agency they divide their lives into before 9/11 and after 9/11 because before 9/11, everyone had a career that followed a certain path. You joined a certain division and you accomplished certain milestones, you went overseas, and then you know you got better jobs overseas, you came back in between, and then you retired, and then you sometimes went back and forth as a contractor with the agency. So then, and then those who were trained in, as State's officers you know we had the trade craft that we were taught, and that was applied vigorously, and it followed a certain format, you know recruiting and development, and things like that, of Foreign Intelligence Office. After 9/11, all of that changed, and no one pretty much was you know had a sort of straight-line career path anymore. Everyone, everyone, just about in every division, and particularly when this counter-terrorism center stood up and expanded, it all became about the warzone, and getting to the warzones, coming back out, you know and then being assigned somewhere else, several purges, to support warzone efforts. And then, as a result as well, trade craft sort of went in a different direction because as you can expect, you really can't do a surveillance inspection in Baghdad, for example. Right? It's a completely different way of assessing and spying and developing foreign intelligence sources to work with you." "What was it like for you after 9/11? What was your connection if there was one to the rendition of Abu Omar?" "So for me, after 9/11 my work was primarily in the counter-terrorism. And you know I was in Rome, I was in Milan at the time. And there wasn't a single holiday and there wasn't a single Christmas, I think, that ever passed by without the threat level going up. We really couldn't plan vacations and be sure you were going to go on vacation. For example, the ski trip that I was taking when this whole Abu Omar rendition went down, it was on a school calendar. I was hoping I could go, and I didn't know what was going to come up at the beginning of the school year, which was in June, and of course this rendition took place the following year in February, and I was happy at the end that I could go, because I didn't have any involvement either in planning or making any decisions on this rendition. So I went on that school vacation. So that pretty much was the kind of life everyone had at the time – a lot of uncertainty, a lot of changes in careers, a lot of families refused to allow their you know their spouses who were working in the agency to go to a warzone. As a result, they were stuck in headquarters, and their lives and embassies pretty much finished by then." "So you were on a ski trip with your family when you learned about Abu Omar's rendition and you were only made aware of it after the fact, is that correct?" "Well I wasn't aware that he was picked up because as you know, this thing was in the planning stages for quite a while, but the planning was all taking place in Rome, even though the actual kidnapping took place in Milan. But when I went off on vacation, Abu Omar hadn't still been picked up." "Can you elaborate on the charges by the anti-American prosecutor, Spataro in Milan, were handed down?" "Yeah, the investigation started in 2005. I was one of the last to be indicted. It happened in batches, the first 13, then 19, then 23, then 26, and I was the 26th. And this was, so the first batch came out in 2005, and the last in July, July of 2006. So, the charges against me were very broad. The prosecutor said that I was a very senior officer, and therefore it's not possible that I, number one, that I didn't know that the renditions were going to take place; secondly, he accused me of planning and devoting resources to the operation, and without my approval the rendition wouldn't have taken place. Then another charge was that I warned, and this was two years after the rendition, then they raided Bob Lady's house, they found an email sent from a secretary to Bob, who was the Chief in Milan, and he accused me of obstructing an investigation by warning everybody not to go to Italy. The email actually came from citizens who had gotten from [UI Name] who I guess was in charge of following was the prosecutor was doing. So it was a big leaps kind of like relations and assumptions but the prosecutor had clearly said and he said this to the Washington Post which I guess many years ago and it was referring to my case and they didn't need the smoking gun to obtain conviction. It's the old Mafia legal system where they can go with third-hand information." "Is it correct to say that when these charges were brought against you the CIA and the State Department did nothing to protect you or to allow you to defend yourself which, in turn, led to your conviction in abstentia in 2009?" "That's correct, yes. As soon as this, I was still working at the agency, and none of us were allowed to speak to the press, contact our court-appointed attorneys. In fact, in my case, because I was pushing back such a lot, the CIA wouldn't even tell me who my court-appointed attorney was. And I guess they were afraid I'd pick up the phone and call her or something. In the meanwhile, the Defense Department, the one U.S., senior U.S. military colonel who was indicted as well, the agency would not allow the Department of Defense to assert SERPA for this officer, which is a highly unusual move. And from what I understand from the Colonel Romano's JAG attorney, this was the first time in the military's history that the military was allowing a conviction of a senior colonel to go forward, even the security officer, the American security officer for the base, the Aviano base. And the prosecutor alleged that Colonel Romano allowed the rendition vehicles to pass through onto the base and the rendition aircraft to land in the air strip on the base. And those were the charges against him, and based on his phone, I guess, that he had." "And Colonel Romano received a pardon in 2013 along with several others, all of whom were protected by the agency. Tell us a little about that compared to what you experienced from the agency." "So, so Colonel Romano, so what happened was the, like I said, the agency would not allow, and this was General Hayden at the time, which is surprising being a U.S. Air Force General, you know, throwing one of his own under the bus, anyway, Hayden wouldn't allow Gates to, Sec Def Gates, to assert SERPA. Finally, when it came down to a month before the trial was to end, and it was very certain that Romano was going to get convicted, the principals had a meeting and decided that, yes, now they were going to go break with the agency on this and go ahead and assert SERPA for Colonel Romano. So, they went ahead and did that, and informed the Justice Ministry that they were serving SERPA. The Justice Ministry said no, you can't do it now. And then the U.S. pressed, SERPA was asserted, but it was too late in the trial, and the prosecutor and the court said no because why would you do it four years later, so, or five years later. But under normal circumstances, the Department of Defense employee who was going to be either investigated or arrested overseas, immediately DoD asserts SERPA. Right? So, they did not. Anyway, so Colonel Romano gets convicted. And we were all promised we'd get a pardon, once we were told, before the trial ended, if we get convicted. "How did you feel and what came through your mind when you realized your chances of getting pardoned were slim to none, and what did you do when you came to this realization?" "So, in 2013 after a lot of work, and I found this out through my FOIA lawsuit, many hours of working with the Italians, and I think they closed a loop if I'm not mistaken, a loophole in the status of working agreement with Italy, to allow Colonel Romano to get his pardon. He was the only one pardoned by President Napolitano. And at that point, President Napolitano said then 'I'm closing the chapter in this thing; now we can all move forward.' And that really surprised me and got me really upset because that meant no one else was going to get a pardon. And I had been waiting, because you know I am a dual citizen, to go to Portugal and meet my family who I hadn't met in like over a decade, and because of my travel ban, so I decided to really speak out. By then I had resigned from the agency because I had to go see my mother, and I was not allowed to, my mother had cancer at that time. So, I resigned, I lost my pension, and as you know I traveled to India. The next person who got a pardon was Betnie Medero, in December of 2015, and a partial pardon for Robert Seldon Lady, cut down his sentence from seven years to four years. And the reason for that is because a sentence of four years or less you can't be extradited. So that was the end of all the pardons." "What happened when you put in your request for a pardon?" "My attorney, my Italian attorney put in for my pardon, my request for a pardon at the end of 2013 with an addendum in 2014, based on a court ruling, constitutional court ruling, that granted all the Italians immunity because the court found that the relationship between Italian intelligence and foreign intelligence services were state secrets, and therefore they couldn't be held prosecutable. There's no reason given for why to date I haven't gotten a pardon. Right after Betnie got her pardon, my Italian attorney went to the president's office, made a big fuss about (UI word) why haven't you even looked at her case. And then the Magistrate of the President's Office said – well, then you need to explain these very serious charges against her [Sabrina de Sousa laughs a bit], which are you know what I explained – oh, she was in charge of planning, she was very senior, etcetera, etcetera. And so, he said, 'Fine, I'll explain it,' and he did; he put together a really good document. The document was sent to the agency for clearance. It said, 'Any further clarification will require the removal of state secrets for the Italian and U.S.' And then for no reason whatsoever, the case stopped right there. I mean nothing happened further with the president's office, and the case was transferred to the Ministry of Justice, and I had absolutely no idea why." "You've mentioned some concerns about former CIA Director Brennan, would you elaborate on some of these concerns? What do you make of Director Brennan's secret trip to Portugal?" "Well, before, during President Obama's time in office, you know I had spoken out, I pushed back, particularly when it came down to the business of the pardon. While I was at the agency, I went to the IG's office twice, I went through all the internal mechanisms. And then, by a law that we have, I was allowed to dialogue with Congress. And Jones Day, who represented me at the time, wrote about, oh, 15 letters to Congress, and Mukasey, and Holder, and just about everybody asking them to look into my case, and talking about various aspects of it, including diplomatic immunity protection of you know intelligence officers, etcetera, etcetera, and none of those were responded to. So, I you know went public. I started speaking. I filed a lawsuit against State as a State Department officer, since the agency kept saying I didn't work for them. And so, I think back before, during Obama's time I think that is what obviously got Director Brennan very upset. At the time, he was the counter-terrorism czar at the White House, and after that he was Director of the CIA. Then, what happened during this transition I heard, in fact I heard this on the 15thof February, and I was picked up on the 20th, my lawyer called me and he said, 'By the way, you should probably know this,' and I went to his office and he said that he had a meeting with the head of Portuguese intelligence. The purpose of the meeting was because evidently the head of Portuguese intelligence was going to be speaking to a member of Congress here in the U.S., and he said, 'Also, by the way, you know I was told by the head of intelligence that Director Brennan has made a secret trip to Portugal at the end of November.' Now, my, the following week, this judge ordered my immediate extradition, under very unusual circumstances. And this is not just my opinion; it's the legal opinion as well of many lawyers. And I, in thinking about this, one of the things I believe happened is, as you know, President Obama had stopped the program, the torture program, (UI word) interrogation techniques, put a ban on that. And then President Trump said he would like to bring it all back. I believe that if I was picked up at the time I was supposed to be in December, there were a few things that delayed it, I would have gone straight to prison, and I would have been a reminder to all those at the agency, what would happen if they followed through with President Trump's directive. I mean I think that makes the most sense to me. Otherwise, why would he go down there to Portugal during the transition?" "What has been the cost of this ordeal been to you and your family?" "A lot (UI word or words) emotionally, because my family is living abroad. My mother, and she knew something was wrong. She didn't know exactly what. She had never heard of rendition. So, no one said much to her about that. You know my father passed away during this, during this period. It's been hard on my husband, particularly in the last two years, who, I know I made the decision to try and resolve this on my own since I've exhausted everything in the U.S., so the emotional toll from the whole thing, because you know here's my husband, who thought he was you know going to be retired happily ever after with me, even though I didn't have a pension at this time, and here he was you know following me up around, packing, unpacking, extradition no, yes, moving to Portugal when I was in prison over there. And then the financial toll of – yeah, you know I don't have a pension; I have not been able to work for several years now; and you know maintaining a house in D.C., because we didn't know whether we should give it up or not, and how long I would be in Portugal; and then court fees, there are a lot of court fees, there are lawyers' fees, there are just miscellaneous fees of travel and things like that; and now I have to set up residency in Italy, which is quite expensive compared to Portugal, that's going to be a huge drain on us as well; so, it has taken its toll; and obviously, health-wise too, you know I've never been in such poor health in my life. But, that's pretty much what's been going on so far." "I want to direct this next question to Pete. I know you've spoken to a number of folks about Sabrina's case. Tell us about some of the work you've done regarding the case and how it's helped to improve Sabrina's situation." Well I've talked to people in the intelligence community, I've talked to people at the State Department, I've talked to people in Congress, and at the National Security Council, all with one very, very simple message – this is about making sure that you know for people who have put their lives on the line for the U.S. government, and in this case in our intelligence community, it is important that we send a message to the rest of the world, and we also send a message to those people who are currently occupying those positions, that America has their back. "Sabrina, in Sabrina's case, you know the activities that the CIA office apparently in Italy were, that they were asked to do, these activities were approved at the highest levels of our U.S. government, probably going all the way to the White House under George Bush. And so, you know when we have people at the grassroots, the people who actually have to implement U.S. policy, they need to know that America and every element of our government will have their back. In Sabrina's case, what we've now seen for what, Sabrina, almost nine to 10 years, there's been no one assigned to assist her at the U.S. government, the activities that she's been involved in to defend herself have been at her personal cost, and what does that mean? It means she actually has to cut the checks to the lawyers that are defending her and keeping her out of jail for the activities that the U.S. government, and probably the Italian government, approved of. "What is the most important thing you want to accomplish regarding Sabrina's case?" "You know, Sabrina has already spent time in prison, most recently you know the 10 days where she was awaiting extradition to Italy. But the thing here is as we talk to these folks in the Trump administration, there was a renewed energy and interest in doing exactly what Sabrina and I thought was very important, sending the message to the American people and the CIA and other intelligence organizations – we're not going to leave you behind. The important thing is we hit the first milestone, although 10 days late, Sabrina spent 10 days in a prison, that she should never have spent in prison. And now we're continuing to work with those same organizations in the U.S. government to get to the resolution that we want, which is what? "Number one – we're not looking for a pardon; Sabrina didn't do anything wrong; we're looking for an annulment. And why is this critical? Some of the things that normal Americans can do each and every day – TSA, and those types of things – if you're a convicted criminal overseas, you're no longer eligible for those programs, you're always a marked person. There's no reason for Sabrina to have this kind of stain on her record. We're looking for you know for her to be compensated for the cost that she has incurred, the expenses that she has personally incurred to protect herself as she defended herself for the activities that you know she undertook while she was in the CIA." "I understand that Sabrina could possibly end up having to testify in front of the Senate Foreign Intelligence Committee in Italy. Do you think that the Trump administration will make that unnecessary? And do you believe that the Trump administration will keep up the [UI word] measure on the Italian Prime Minister and the Italian government to ensure the annulment of Sabrina's conviction? "I think that's exactly what the Trump administration is organizing itself to do. Obviously, much of this happened during the transition from one administration to the next administration. President Trump hasn't even been in office yet for 100 days, and I think, Sabrina, you'll agree, we've made more progress in those first 60 to 75 days than you've seen in almost eight or nine years. Isn't that right?" "Oh, absolutely, because if this extradition had followed through on the 7thof December, I would still be in prison, because once in prison, as my lawyer said, Italian law they're very liberal, anyone could do in a hurry to get me out, and it would take up to a year before I would be eligible for this community service, you see, which is again, going back to the point of why Brennan was in Italy. And again, it was one of those things you know I think Obama legacy, you know preserve Obama's legacy by making me an example of him." "And so, I think what we're going to see is, yes, the Trump administration is going to move forward on this. I believe that they are going to agree with our assessment that forcing Sabrina to go to Italy and to serve three years of community service, where she will be under tight time constraints in terms of when she has to be at her residence in Italy, where she will be under tight constraints about where she can travel while she's in Italy on community service, who she can see and who she can't see – that's not an acceptable outcome. That is not where we want this to end up. And so, yes, I think the Trump administration is going to continue working with the appropriate authorities and to, in Italy, to get to a satisfactory resolution." "What would the best possible resolution look like for Sabrina? Would she be able to regain some if not all of the money she's spent on her legal defense so that she can finally move on with her life?" "I think, as I said, the first I think most important thing is to see an annulment of any and all legal activities and convictions against her, cleaning her record. The second thing would be to make [word cut out] financially whole. You know she had been prosecuted for activities while she served, was serving for the U.S. government. And so, yeah, those two are almost kind of a given, a minimal solution, a minimal resolution to what we want to have done." Italians immunity, for asserting state secrets on the whole, on the whole case, not my case, but the whole thing, and as well as asylum absentia for Abu Omar. So, it's very difficult for the Italians to grant pardons, number one, and, again, to me I wasn't ever interested in a pardon, I've always said I wanted to clear my name, and so the best possible resolution is the annulment. And the annulment can take place with a revision of the charges against me which is also difficult in Italy, but I think this would be the best solution for the Italians as well. And to do that I would definitely need to be in contact and have what I present in a revision, to show that you know for my defense, with the intelligence community (UI few words), because clearly, we want to make sure we could talk classified information." "If you had to testify before the Italian senate intelligence committee, would there be a lasting negative impact on U.S.-Italian relations or on the morale of the agency?" "Well, yes, something that wasn't really explained fully, because I had like three minutes I think on Fox, but you need to realize why the Italian intelligence service is very interested in talking to me. Last year, in October, the Italian intelligence service discovered there was a document that the internal intelligence service had put together, formerly known as (UI word). This document they, this document resulted in, the existence of this document resulted in the intelligence oversight holding numerous hearings. When they had these hearings, they found that the entire narrative that's there, out there right now, which is that trade craft, is wrong, and it, and in their own words, it threatens to change the entire Abu Omar story. Now, this is something I've been saying all along as well, without obviously giving out any details, saying that you know not so much the narrative, but you know the issue of not being able to adequately defend myself or anyone being able to do so, which is why the prosecutor didn't just you know focus on the, that trade craft. So what happened over the years, I suppose, I mean no one really paid much attention to, I guess, what I was saying about it, but once the Italian intelligence figured out that really there is an issue over here, and they do want to get to the bottom of it, they do want it released, which the Italian intelligence services aren't doing, they started calling it a political cover-up, and they continue to insist on it, on doing it, and very soon what they will do is sanction the internal service by some law in Italy that they sighted, I can't remember it, for not disclosing that document. Now, several members of the European Parliament as well, and there are quite a few of them, who have said they want this document released because too many Italians have been unfairly convicted. And you know I have to agree with that, because I feel I've been unfairly convicted. So, you can see why now they want to speak to me because of I guess they have, they both have been saying pretty much the same thing. You see?" "I want to go back to Pete for a minute. Do you see a need for any new legislation to prevent future situations like the one Sabrina has unfortunately had to endure?" "I don't at this point in time see a legislative remedy for this. I mean this clearly, normally these decisions fall within the discretion of the leadership with the agencies and those types of things, and you're always going to have to allow for some type of discretion. Obviously, the stance that the Trump administration is taking vis-à-vis Sabrina is very, very different than what the Obama administration has done. And so, and you can't fix that legislatively. You can only you know those are the things that reflect a mentality or an approach to national security from a President of the United States and their designated individuals who implement that foreign policy. You know you can't go out and just legislatively say you know whenever you know certain conditions the U.S. government will do this. They need some type of discretion, but, the, so there's not a legislative fix; this is, this needs to be a, this ultimately, and Sabrina will be you know her case will resolve because of the different type of leadership that you're going to be seeing, and that we have seen coming out of the Trump administration." "I kind of agree with that because as with my case, and there are a lot of lessons to be learned over here, is that the, if there's such a strong desire for self-preservation at the senior you know levels of the CIA during the Obama time, that they really were not concerned about the impact, the impact, I mean personal impact is one thing for one person to go through, but the impact of what everyone sees. I mean I've talked to people who go, you know journalists who would tell me, you know – we talked to you know different intelligence organizations and they say they would never have a case like this, that they absolutely throw one of their own so publicly under the bus for so many years. So, I think that was the issue, because this was such a mess-up this whole operation, and then it was a matter of self-preservation at all cost. And one of the biggest costs was the status of (UI word) agreement and diplomatic immunity. Don't you agree, Pete? I mean that was a huge cost to this thing." "This could have been resolved a long time ago, as Sabrina has said, number one, by just providing her with the diplomatic immunity that she got, that she should have had just being a U. S. diplomat in Italy. Italy is an ally. And you know so it should never have gone this far. I think the most disappointing thing to me in this whole process is that it has taken Sabrina almost nine or 10 years for her to actually to find a couple of champions for her, that were actually willing to fight for her and to work with her and to take the issue to the government. You know there, it appears there was nobody in State, in the State Department, there was no one who was willing to run with it in Congress, there was no one who was willing to run with it out of the CIA, and say – wait a minute, this is wrong, we can't do this to Sabrina, and we can't let this happen to her. It took you know that long, John, until you know you were involved, you got me involved, and you know now we have the Victoria Toensing involved, and we've now developed a small cadre of people, both in the private sector and you know people in the media as well, who have all been willing to take this case on and say – no, this, what's happening here you know is just wrong and it needs to be fixed." "Do you have any final thoughts on this pressure to finally resolve your case?" "No, I think Pete's right. This is the first time actually in all these years that, two things happened, either nothing happened, or there was an active, a plan to stop me from doing something, you see, from (UI word) progressing, and this was especially last year, when my lawyer was trying, I was trying, and then actively the CIA stopped it, stopped anything from happening, or even proceeding on my own and trying to obtain resolution to my case. So, this is indeed the first time I don't feel like (UI word) like a rogue officer running off doing my own thing, you see? And it's absolutely, it's really miraculous in the way if you think about it, a just sudden turn of you know events, in January with the president who has come into office who, you know I've always thought I mean if anyone's going to protect the rank-and-file of the CIA, I think it's going to be this president. And I hope that's the precedent that's set for the future and no one has to go through what I've been through, or you know the rest of my colleagues, who have no input into the decision-making process for the State." "We will get this resolved. I'm not sure how long it will take. But it will either be because of you know more proactivity coming out of the Trump administration, or it will be resolved because of events on the ground as they take place in Italy. But you know it will get resolved." "Well thank you, Sabrina and Pete, for joining me today on our first Podcast. It's been a wonderful discussion, and I look forward to speaking with both of you soon."